I’ve written about the Australian red meat industry’s response to the documentary film Cowspiracy in two previous posts. This post consolidates the key points and provides some new perspectives. Based on that level of representation, it seems that the industry is keen to defend itself against the movie’s claims. In its website posts of October and November, 2014, the industry put forward seventeen arguments to support its position. Some of those arguments, relating to research activities and methane, were effectively repeated many times. By my reckoning, the result is that only twelve distinct arguments were presented. I’ll consider them all in this post, with some repetition from my previous posts. [Footnote 1]. With four of the twelve arguments, the industry has figuratively shot itself in the foot. At the time of writing, the industry is claiming on its website that the director of The Pew Charitable Trusts‘ Outback Australia program, Dr Barry Traill (mis-spelt “Trail” on the website), argues that using arid land for cattle grazing may be positive in Australia. The evidence they cite is Dr Traill’s TEDx presentation of May, 2014, “Populate wilderness or perish“. Dr Traill’s comment on the cattle industry occupied just 5 seconds of that 10 minute 48 second presentation. He said (at 9:05), “Many cattle station owners are doing a great job of managing their part of the outback”. But do the words “doing a great job” mean livestock grazing? He may have meant that many pastoralists are reducing livestock numbers and diversifying into other activities with clear environmental benefits. Dr Traill co-authored Pew’s October, 2014 publication, “The Modern Outback: Nature, people, and the future of remote Australia“. 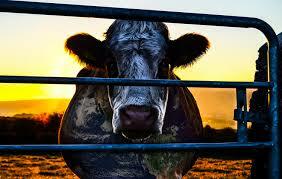 The authors have commented extensively on the destructive environmental impacts of grazing. Problems include tree clearing, introduction of invasive pasture grasses, degradation of land and natural water sources, and manipulation of fire regimes (p. 167-171). In the report mentioned above, he and his co-authors highlight the need for people to help manage the environment, but their position should not be interpreted as one that promotes the idea of more pastoralists grazing livestock. The report highlights that extensive benefits have been derived through the introduction of indigenous ranger groups and the declaration of indigenous protected areas (IPAs) across huge regions. There are now 67 IPAs covering more than 540,000 square kilometres, which is more than twice the size of the state of Victoria. There are also more than 750 indigenous rangers managing and safeguarding the land. The organisation certainly does not appear to be supporting grazing activity in terms of environmental performance. The industry says that greenhouse gas emissions are just one aspect of environmental management. It says that while there is enormous focus on how to reduce methane emissions “this needs to be done with consideration for impacts on other important environmental factors such as biodiversity”. Although the industry is supporting research in relation to issues such as water, soil and ground cover, and biodiversity, much of the research can only assist in finding incremental improvements relative to the benefits that could be derived from a general move away from animal agriculture. The industry seems keen to point out that the extent to which cattle are grain-fed in Australia is lower than in the US. They don’t seem to recognise that while cows are fed on grass, they produce far more methane than when they are fed on grain. Perhaps the industry has overlooked the research it has funded, and believes that the natural way is best in all respects, when clearly it is not. At least they’re not alone. The Australian Conservation Foundation (ACF) and Bill McKibben of 350.org have made similar claims, with neither citing any evidence for their position. However, the ACF has subsequently removed its comments from the relevant websites. The industry claims that the Australian production efficiencies have resulted in a 5.3% reduction in emissions per tonne of beef between 1990 and 2010. Why does that represent a shot in the foot? The industry applauds a 5.3% reduction in 20 years, which equals an annual rate of 0.286% from the reducing balance. At that rate, it would take 243 years to achieve a 50% reduction from the 1990 level. 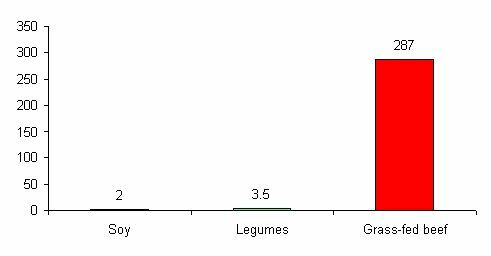 If we were to halve the figure for grass-fed beef (perhaps generously assuming Australia’s figure was half the global average), and then halve it again looking ahead 243 years, then the figure for grass-fed beef (72 kg/kg CO2-e) would still be around 20 to 35 times greater than that of legumes and soy beans (using a 20-year timeframe for assessing the global warming potential of relevant greenhouse gases). In any event, we can’t wait 243 years or more to turn this problem around, particularly when a rapid and dramatic improvement in our food system’s environmental performance could be achieved by simply moving away from animal-based products. I have commented on these arguments elsewhere (see article links below), so will only comment briefly here. The “Target 100” title refers to one hundred industry initiatives, including research, aimed at improving its environmental performance. However, in terms of global warming, the performance of animal-based and plant-based products are on different paradigms. No amount of research is likely to reduce animal-based emissions to a level that is realistically comparable to that of the plant-based alternatives. The industry states that it does not buy grain from the Amazon, and that the Australian industry’s emissions from deforestation have reduced dramatically since 2006. The recently elected Labor government may review that legislation, but the forests will always be at risk of further clearing, depending largely on the inclination of the government of the day. The recent free trade deal with China is likely to increase pressure for further livestock-related land clearing. In any event, we must live with the legacy of foregone carbon sequestration, which is not accounted for in any official emissions figures. The industry points out that the figures it uses are aligned with those of the Australian Government’s National Greenhouse Inventory. That’s true, but as I have stated elsewhere, critical under-reporting of livestock’s impact occurs in many “official” figures because relevant factors are omitted entirely, classified under non-livestock headings, or considered but with conservative calculations. Do we want to know what’s really happening so that we can identify necessary mitigation opportunities, or do we want it masked in this way? The life cycle assessment study cited and funded by the industry did not appear to include land clearing and certain other factors often included in such studies. Even without those factors, the results were very poor, with beef’s emissions intensity figures being multiples of plant-based alternatives. As an alternative, applying a 20-year GWP for relevant gases to the FAO’s average emissions intensity figure for specialised beef in Oceania (which includes Australia) , and adjusting for retail weight, would result in a figure of around 100 kg CO2-e/kg of product. The figure for grass fed beef in isolation would be significantly higher. Grain grown solely for animals? The industry claims that cattle are not consuming grains that humans can eat, and are therefore not depriving those who are undernourished of food. The resources (including land) used to grow grain for cattle have many possible alternative uses, including food production for humans or regeneration of natural habitat, helping to draw down existing atmospheric carbon as a critical climate change mitigation measure. Utilising those resources to provide food for livestock in a grossly and inherently inefficient system is unnecessary, unjust, and incredibly damaging to the environment. The industry argues that “Cowspiracy” is incorrect in suggesting that no environmental groups are looking into the beef industry due to its political power. It refers to the World Wildlife Fund’s involvement in the Global Roundtable for Sustainable Beef. I argue that a transformational change of diet is required, rather than a search for “sustainable beef”, which is a term I regard as an oxymoron in the context of our current environmental emergencies, including climate change. Secondly, the figure is based on a 100-year time horizon. 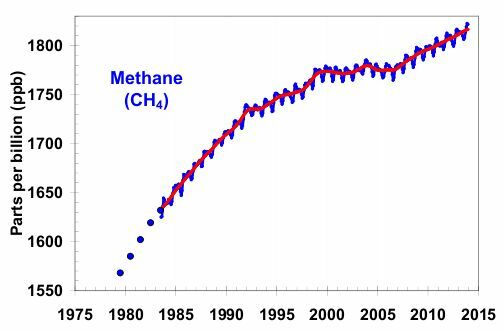 A 20-year time horizon may be more appropriate when considering methane’s emissions due to the relatively rapid breakdown of the gas in the atmosphere. On that basis, the IPCC reports that methane is 86 times as potent as carbon dioxide (with climate carbon feedbacks). Thirdly, the page refers to the “International” Panel on Climate Change, when the correct term is “Intergovernmental”, as referred to above. The red meat industry can argue forever about the supposed environmental credentials of its products. However, we face a crisis in the form of climate change and other environmental issues. Those without a vested interest need to face the reality of that crisis, and fight for urgent action. It is pleasing that the United States Dietary Guidelines Advisory Committee has recently recommended a reduction in meat consumption for environmental and health reasons. That development may add to the general awareness that appears to be developing in respect of climate change, including animal agriculture’s adverse impacts. 1. In assessing the industry’s various arguments, I have categorised two concerning grass-fed cows as methane arguments, due to the fact that grass-feeding is a key factor in that regard. The figure of 287 attributes all carcass weight emissions to retail cuts of meat. If emissions are also attributed to other products that may be derived from the carcass, utilising fat, bone and the like, then the emissions intensity of the retail cuts will be lower than shown here, at around 209 kg CO2-e/kg product. The figures are based on the breakdown by the FAO of the different greenhouse gases contributing to beef’s emissions intensity (CO2 26.9%; CH4 44.0%; N2O 29.1%). As each of those percentages represents the average between grazing and mixed systems, the figures for grass-fed beef may be understated. That’s because methane’s share of emissions in a grazing system would be higher than in a mixed system, and the methane figure is grossed up considerably when adjusting for a 20 year global warming potential. The emissions intensity figures vary significantly by region. Comments regarding retail cuts of meat added to Footnote 3 on 4th April, 2015. Main Image: From Cowspiracy: the sustainability secret, http://www.cowspiracy.com/. Used with permission. Derived from Russell, G. “The global food system and climate change – Part 1”, 9 Oct 2008, http://www.bravenewclimate.com, which utilised: Dept. of Sustainability, Environment, Water, Population and Communities, State of the Environment Report 2006, Indicator: LD-01 The proportion and area of native vegetation and changes over time, March 2009; and ABS, 4613.0 “Australia’s Environment: Issues and Trends”, Jan 2010; and ABS 1301.0 Australian Year Book 2008, since updated for 2009-10, 16.13 Area of crops. A well researched rebuttal –and interesting too.